Old Man Yells at Bulbasaur: My First Day of Pokemon Go « Midlife Crisis Crossover! It took me 44 years to catch my first Pokemon in the wild, but the goal I never had until today has been achieved at last thanks to rapid advancements in phone technology and Japanese monster-tracking software, whose use was made possible by a slow day at Indianapolis International Airport. Hot travel tip: as of 11:45 @INDairport Concourse A's TSA line had no wait. Perfect time for impulse travel! …and we’re in ‘n’ out in five minutes, tops. That left us with a lot more time on our hands than we’d expected. Poor lunch service at one of the Concourse A restaurants ate up a fair chunk of that, but eventually my son and I got to chatting aimlessly and the subject of Pokemon Go came up, and how people in our respective circles won’t shut up about it. For those unfamiliar with the craze that’s sweeping the nation: Pokemon Go is a new phone game that takes your tiniest relatives’ favorite cartoon or video game and adds elements of geocaching and exercise. When you launch the game, the screen shows you locations in your vicinity where Pokemon and related tools and items are fictionally located. You have to get out of your seat, walk to the indicated spots but in reality with your actual body, and when you reach the GPS coordinates tied to each imaginary highlight, you tap the spot on your phone, your camera turns on, and suddenly a love Pokemon or Pokemon accessory shows up on the screen superimposed over the very fabric of reality itself. The more you walk around, the more you can catch. The more you leave the house and get some fresh air, the more you’ll presumably amass a Grand Pokemon Army of the Republic. If you gotta catch ’em all, I guess you’d best be prepared to rack up some serious frequent flyer miles. 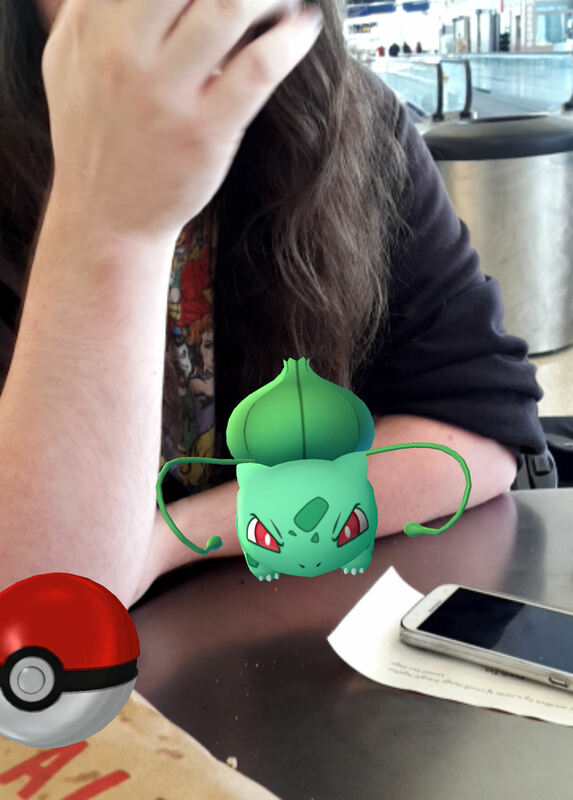 Anyway, that’s the source for the above photo, my son little realizing he’s defying physics by occupying the same point in space-time with an illusory, cranky Bulbasaur who kept whipping his vines at me right there across the airport table. I’d like to tell you it was skillful marksmanship and the tracking skills of Strider that brought me directly to Bulbasaur’s hideout, but it’s more likely the angry li’l walking Brussels sprout is mere tutorial prey for every first-time Pokemon stalker. The instructions were simple: turn the camera toward him, swipe at the Pokeball till it flies at the adversary and swallows them, then celebrate your animal-trapping victory. Our confrontation got complicated at first because taking that screen-shot caused the Pokeball to lock up and stop responding to my increasingly irritated swipes. I shut down the app, restarted, swiped again, and his leafy green soul was MINE. #PokemonGO War Journal, entry 1: airport GPS terrible. Bulbasaur, 3 Pokeballs, lots of false flags. How's a grown man supposed to win here. Found 3 Pokeballs in our hotel room, which is itself roughly the size of a Pokeball. It's a puzzling #PokemonGO paradox. …so as of bedtime I’m stocked up on Pokeballs but have no other quarry except Bulbasaur, who I’ve now renamed “Bull BeSoar” just because the game permits renaming your captives, and because I like the idea of distancing him further from his loved ones to complicate any future rescue attempts. So that’s a thing I did today on vacation. Meanwhile my wife insists if my son and I obsess on this game all week long, she’s gonna stay holed up at the hotel and watch HLN all day. Updates and wall-mounted Pokemon trophy heads as they occur.